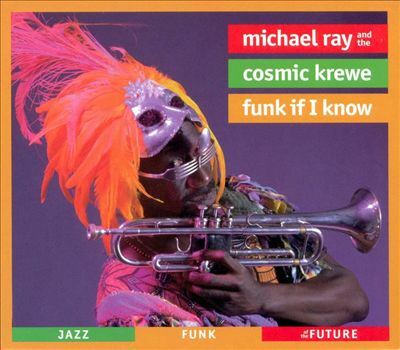 The Cosmic Krewe’s music is an almost perfect hybrid of trumpeter/keyboardist/vocalist Michael Ray’s two most significant former gigs. Here, as on the band’s 1994 debut, Ray’s Krewe swings effortlessly among the playful sing-song melodies and free jazz exotica of Sun Ra’s Arkestra, and the horn heavy, high-energy R&B funk of Kool and the Gang. It may not be fair to judge an album by what it isn’t, but in this case it is necessary for the proper perspective. The Cosmic Krewe’s live shows are a spectacle to behold, with dazzling costumery and lights to complement the delightfully unrestrained improvisations and free jazz journeys that can literally go on for hours. The pieces presented on the band’s albums are for the most part merely the song heads, used as the occasional anchor points during a live show. On Funk if I Know there are a few places where the live adventurousness breaks through, but for anyone who has experienced the real thing, the studio recordings can come across as a bit hollow and abrupt. That said, this album does feature some tight fusion grooves, numerous catchy themes, and copious amounts of dexterous soloing from the whole band. Unfortunately, the music tends to shy away a bit from the Sun Ra side of things, leaving this a somewhat mediocre and one-sided document of a tremendously talented and exciting ensemble.